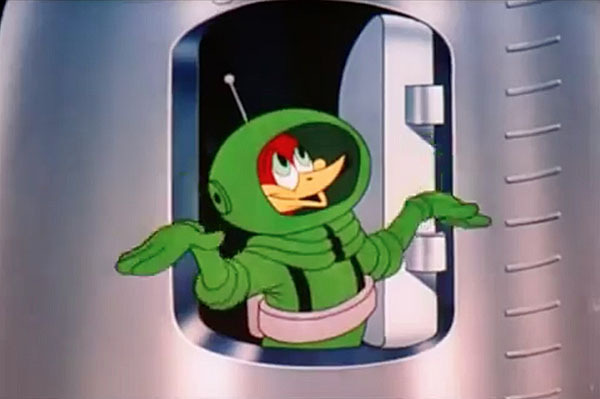 If there were any questions of political or national sympathy, then one could easily point out that during the Second World War, Woody Woodpecker had been fluent in Russian. Despite this, his actions remained mercenary or opportunistic, almost apolitical despite his revolutionary fervor, leaving the impression that Woody only looked out for himself. In the 1945 cartoon The Dippy Diplomat, it is Wally Walrus who dutifully prepares for a reception with the Russian ambassador Ivan Awfulitch. It doesn’t quite rise to the decorum of a state dinner, but Wally nonetheless sets a backyard barbeque to pay his respects to the diplomat from America’s wartime ally, the Soviet Union. Seeing the news of the visit reported in a discarded newspaper, Woody comes to understand that a free dinner could be in store, so he dupes the walrus into thinking that he is Awfulitch. He leaves little to chance, even arriving in a stretch sedan from the Embassy Rug Cleaner. He is costumed in a long coat, top hat, and a full beard. Then comes the musical performance. I have always marveled at Woody’s song-and-dance in this film, but it was only two weeks ago through a forum message from Valentin Moretto that I understood how clever and language-accurate the lyrics had been. Woody sings the Russian song “Ochi chyornye” (Dark Eyes) made popular by Feodor Chaliapin, an ex-pat Russian who was internationally famous in the early twentieth century. 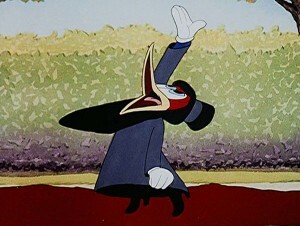 Moretto writes, “The lyrics are somewhat altered from the original but remain intelligible for the Russian-speaking audience.” All those informal Lantz studio lessons in speaking Russian—compliments of assistant animator Alex Ignatiev, which I described in my last post—were paying off with a sequence that apparently has endeared Woody to some Russian fans for its authenticity. Perhaps Woody might have had a chance to perform more hits from the songbook of the beloved Chaliapin, but the years after the war were instead marked by something else—a role in the Space Race that by association seems a rebuke of Russia. The Cold War had turned him, but more specifically Woody came out strongly for capitalists who exploit a resurgent Red Scare to mobilize for a moon mission! His role in this capacity is defined by a guest appearance in the 1950 film, Destination Moon. This is an otherwise live-action feature. The director George Pal and Walter Lantz were friends, and Pal contracted the studio to create an animated sequence to serve the purpose of technical exposition in his movie, not unlike the Mr. DNA cartoon that appeared in the original Jurassic Park. In both cases, the cartoon plays as a film-within-a-film. To see what comes next, you can view it here on TCM or read below. 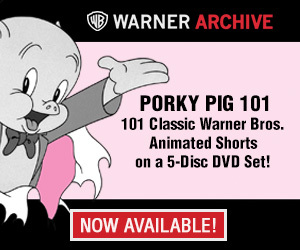 It is perhaps the case that the film’s ultra-rich protagonist Jim Barnes has contracted the making of this cartoon himself. He has assembled his fellow CEOs, all wearing suits or tuxedos, together in his palatial home. When the Woody cartoon is over, lights come up in the smoke-filled room and Jim gets some questions from his guests, none stronger than from a Texas oil tycoon who speaks with a twang. “I doubt it, even in Texas, when you tell them why,” says Jim, with a swagger that makes us wish these assembled gentlemen could put their American might behind some other causes, too. “It just happens we have no choice. If we want to stay in business, we have to build this ship,” he explains. “Did you say ‘have to build it,’ Jim?” asks the Texan. When Jim confirms this, he is told, “If it’s that important, why doesn’t the government undertake it?” and with that statement the political irony has only just begun to spill forth. Then naturally—because this is Hollywood and despite Eisenhower’s famous “military-industrial complex” warning being eleven years away—an American military general is conveniently present in the room. He delivers the dire message that makes the billionaires fall in line to support the rocket initiative. General Thayer admonishes them, “The race is on and we’d better win it. There is absolutely no way to stop an attack from outer space. The first country to use the moon for the launching of missiles will control the Earth. That, gentlemen, is the most important military fact of this century.” Cue the dramatic music. 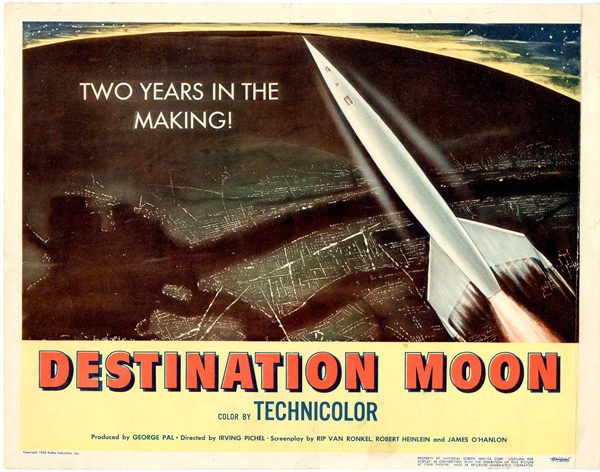 Destination Moon was a box-office hit that is credited for its role in generating popular interest in an American space program. Sputnik flying over our American skies may have been the final straw, but Woody demonstrating rocket propulsion to the masses—and scaring the bejeezus out of U.S. moviegoers with this associated idea of Russian moon missiles—was an early factor in the American public debate over space adventurism. Woody’s role in this was reimagined once again as a bit of historical fiction in the 1998 HBO miniseries From The Earth to the Moon. 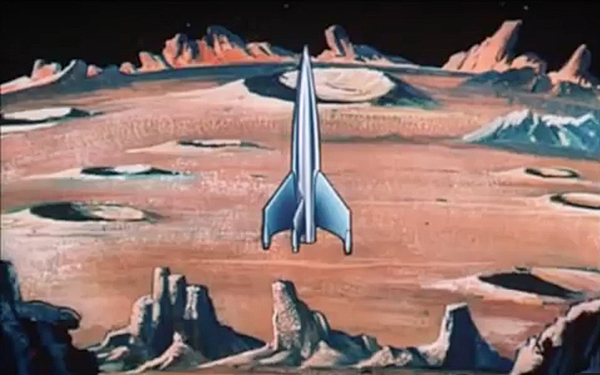 I was hired to be a consultant on the cartoon and was told then that executive producer Tom Hanks had remembered the Woody sequence from Destination Moon and therefore wanted to use the character in a manner befitting his animated contribution to the Cold War. Frames from the 1998 HBO miniseries “From The Earth to the Moon”. When Chaffee’s slideshow fails to fire up much enthusiasm, he says, “I brought along someone who I think can explain this all a lot better than I can.” A moment later, he turns on a Woody cartoon and the crowd goes wild to see a Russian wolf-on-a-rocket get blown up by Woody Woodpecker. This is fictionalized, of course, but it based on something real. It is a casual reference to Destination Moon. Today it is fascinating to look at this in regard to the sentiment it exposes. In a span of just five years, from 1945 to 1950, Woody goes from singing in perfect Russian to becoming a cartoon pitchman for the idea of beating the Soviets to the moon. Yeah, all those nasty capitalists and poor misunderstood Soviets. Stick to cartoons, Professor. Who voices Woody in this 1950 clip? Wow, I take it that’s Gracie Lantz we hear as Woody in the above “Destination Moon” clip? WAY too obvious that he’s being voiced by a woman. It was Grace Stafford who took over Mel Blanc’s spot after he left Lantz’s studio and went back to WB for “Looney Tunes” and “Merrie Melodies”, because he didn’t want to go back and forth. Actually, replying to Chris… Mel Blanc’s “not wanting to go back and forth” wasn’t the issue; he had signed an exclusive deal with Warners (originally with Leon Schlesinger) and COULDN’T work for any other producer. Several people (including Kent Nelson and “Bugs” Hardaway) performed Woody’s voice thru the 40’s. 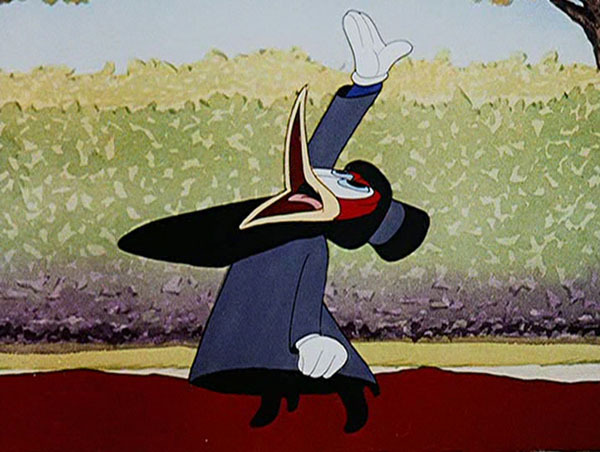 Walter Lantz continued to use the recording of Blanc performing Woody’s laugh, which resulted in a law suit by Blanc, settled out of court. After the two-year shutdown of Lantz’s studio from about 1948-50, Gracie took over the role of Woody. Her performance as the character may not have been fully formed so early, though of course she later became Woody’s definitive voice. The lesser amount of speed adjustment needed to raise the pitch of her voice would give her version a more natural delivery than that of Blanc or the other male actors who had played Woody. And of course, she re-recorded the laugh! It’s like a room full of Robert Benchleys!